I haven't used them yet because I realized that they are way too big for the cabinet that I purchased them for BUT I will say that they are exactly as described and appear to be heavy duty. I figure I would keep them and maybe use it for shelf lining possibly somewhere else. Make your wire shelves even more versatile and add durable shelf liners. With a set of four in each pack, these liners deliver a secure fit and added versatility for your wire shelves. Lightweight and easy to clean, the liners help keep small items in place and permit easy access to items on open shelving. These are great shelf liners and exactly what we needed for our wire shelving rack. Just remember - there are four (4) liners in each pack. Purchased the Trinity Liners to go with my newly purchased Trinity Dark Bronze 3-tier Slat Shelving Rack. Fit great and shipped appropriately. My only grievance is they slide around on the shelves. They would be perfect if they had a non-slip grip on one side so they would stay put. 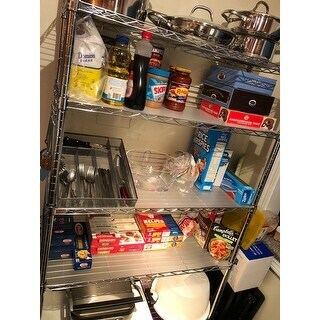 Perfect fit, simple to place .. like a frosted clear not white .. .. my rack is chrome and while I miss seeing that beautiful finish on the honey can do rack .. these liners help utilize the shelves without things falling through... easy wipe to clean up messes. These shelf liners are perfect for the shelfs to make them more useful for storing smaller items. They don't fall through the shelves. The liners and sturdy and are cut at an angle along the corners so they fit the shape of the shelf. My only complaint was mine were bent lengthwise when I opened the box so they have a crease mark halfway down the middle of each one. Otherwise, they're great. I have the Trinity 4-Tier Shelf which I love but when I added the shelf liners, it became even more functional. So much easier to place and remove your items. If you have the shelf, you need the liners. I have excess cooking supplies and gadgets. The liners achieved the results I needed for those items that "fell" through the spaces in the shelving. With these in place, I am better able to use the entire unit, not balancing the feet of grills, etc that would fall through. Will be placing orders for other shelving in the near future. These lay over the top of the wire shelves and make a more stable base for small items & things that have legs that used to catch on the shelf. Great item helps keep items from sliding between reels. Also helps keep shelves clean. Easy to wipe off. 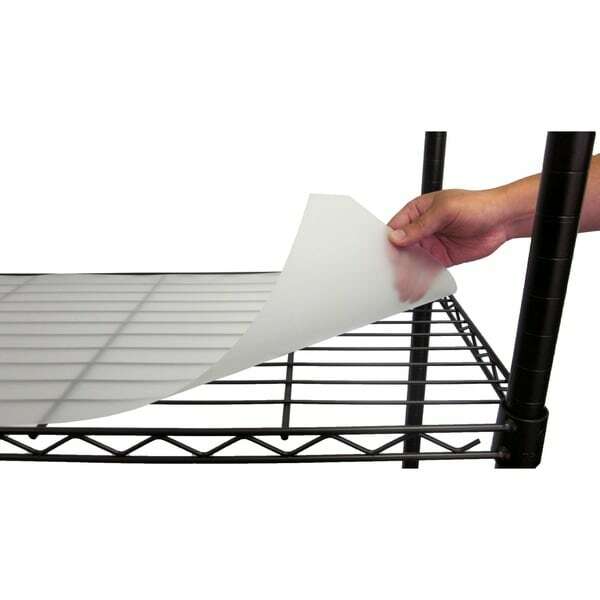 These protective shelf liners protect the shelving and any items that are place on them. They fit perfectly on the Trinity Shelf Unit. Love that they are smooth and can be wiped clean. Very well made and very sturdy! The liners are flexible and yet strong. I like the clear nature of the liner so I can see what is on the shelf below the one I am working on. The liners fit the shelves both depth and width well along with corners that are cut correctly for design of the shelf with no gaps for items to drop thru. Nothing much to say about this. It's as described, and does the job. Would've liked to have had the option for a something a little thicker, but satisfied. I have two metal shelves and these liners are perfect! This lets me store my spices and other small stuff on the shelves without them falling thru. Thank you for carrying this product! It's a wired shelf liner. I would probably like it better if it had been shipped better. Ordered 4 sheets and got bent in transit so now there's a white crease line down the middle. Since it's not a display piece I suppose it doesn't matter but there should have been a stablizer in the packaging to prevent creases. These shelf liners are great, now my cans don't tip over. Shelf liners are really nice and keep things in place. A great addition to the metal shelves. They are the perfect size for each of the shelves and things won’t fall through and wind up on the floor. Worked very well on Honey-Can-Do Steel Storage Shelving. Stay flat and keep items from tipping or falling through and like that they are washable. Not very impress with the quality of the products very paper like. So I needed to buy two packs of these due to having 5 shelves that needed liners...#1 They are way over priced #2 Almost as thin as paper. Not to mention the shipping boxes were torn and bent all to hell. Not happy, I thought they would be more durable and substantial. No complaints with the product, but the liner and the shelves were too big for my space. Sturdy enough to support food items as a pantry shelf. "I have my kitchen appliances on my wire rack, but the feet slip through. Will it hold the weight of a 1cubic ft microwave?" "Can you easily cut these to fit other size shelves?" Yes. I cut mine with a pair of scissors. "How do these shelf liners stay in place? Is there some type of adhesive on one side of the liner?" No adhesive. The corner notches keep them in place. As another customer said, not adhesive. We have no problem with them staying put, though,because our shelves are used for pantry storage, and we keep a generously stocked pantry. These were for keeping things from falling over on the shelves. to help items from falling through the shelf. "HOW MANY SHELF LINERS WITH EACH PURCHACE." Thank you for your interest. This item contains a pack of four. Please feel free to contact us again with any further questions.